The Labels are printed on large sheets of vinyl and then cut into smaller sheets before despatched. 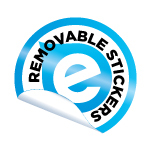 Come in today and look at our Sticker samples at 2/101 Newmarket Rd Windsor Brisbane. Upload a pdf or a jpg file. We will contact you if there are any issues before we commence printing. We will also add the cut line for you.